All tea plants are varieties or cultivars of Camellia sinensis, a species of Camellia, a genus that includes from 150 to 200 species, many of them known for their showy flowers. The two main Camellia sinensis varieties are the Chinese (Camellia sinensis var. sinensis) and the Assam or Indian (Camellia sinensis var. assamica). The species name sinensis indicates that it is native to China. The abbreviation var. means variety, a naturally occurring mutation. Camellia sinensis are classified as woody, broad-leaved, perennial shrubs. They grow from 5 to 6 feet tall and yield white flowers with bright yellow stamens in late autumn or early winter. The small leaves of Chinese tea are dark green with serrated edges, while the green Assam tea leaves are larger with edges that are less serrated. Camellia sinensis leaves contain caffeine; the leaves of common Japanese camellia (Camellia japonica), tea oil camellia (Camellia oleifera) and other flowering camellias do not contain caffeine. 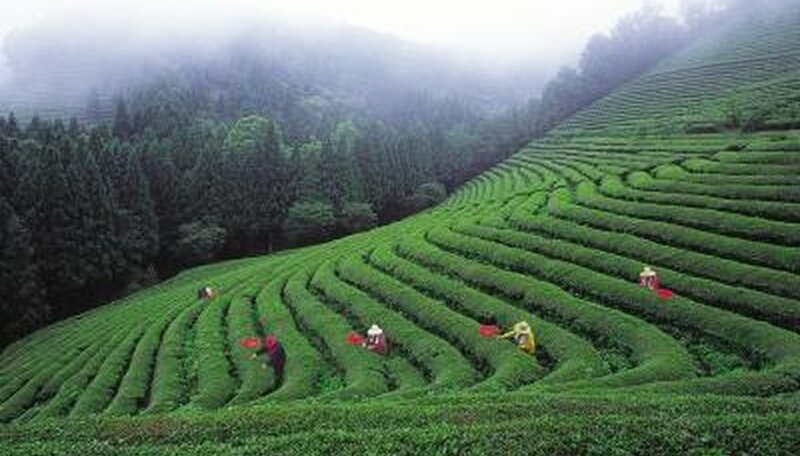 Tea plants evolved to grow in lowland subtropical areas and at high altitudes in tropical areas. Both the China and Assam varieties can be grown in U.S. Department of Agriculture plant hardiness zones 6 through 9. They grow best at temperatures between 65 and 86 degrees Fahrenheit, and cease to grow at temperatures below 55 F or above 95 F. Although their leaves may become damaged, tea plants will generally survive temperatures at or slightly below freezing. Differences in processing Camellia sinensis leaves account for the largest variations in taste among green, oolong and black teas. Leaves made into green tea are heated to 480 to 570 degrees F for 10 to 15 minutes, and then dried at 211 to 302 F for another 10 to 15 minutes. Oolong tea leaves are dried in the sun for 30 to 60 minutes then put in the shade for eight to 10 hours, after which they’re roasted for 15 minutes at 121 to 149 F. Black tea is made from the upper two leaves plus the terminal bud of a tea plant. The leaves are dried several hours until they contain 55 to 70 percent moisture; they’re then rolled, cut into pieces, fermented and dried again. China tea cultivars are used to make green tea in China, Japan and East Asian countries. Most other tea-growing regions grow Assam cultivars, according to the University of Florida Institute of Food and Agricultural Sciences. Differences in brand-name teas typically have to do with their growing region, with some differences in cultivars. Full-bodied, delicately flavored Darjeeling teas are grown more than a mile above sea level in India’s Darjeeling Province. Ceylon teas, said to have “malty fullness and floral tones,” in the American Camellia Society's "Camellia Journal," are grown in the mountains of Sri Lanka. Assam teas vary according to when the leaves were harvested. The earliest leaves yield a rich, fresh taste; those harvested later are smooth and less astringent.